900 CIT results - Dr. Cole on NW3 - Transformation from "pluggy" to "happy"
In 2004, this class 3 came to Dr. Cole for CIT repair. Prior to coming to Dr. Cole, the patient had cobble stoning, pitting and plugs on the frontal hair line from a well known clinic in 2002. The patient’s goal was to cautiously add density without sacrificing naturalness on top. The second goal was to obtain a more natural look and add density to the temple recessions. Temple recession can actually make patients look older than those having recession in the crown. 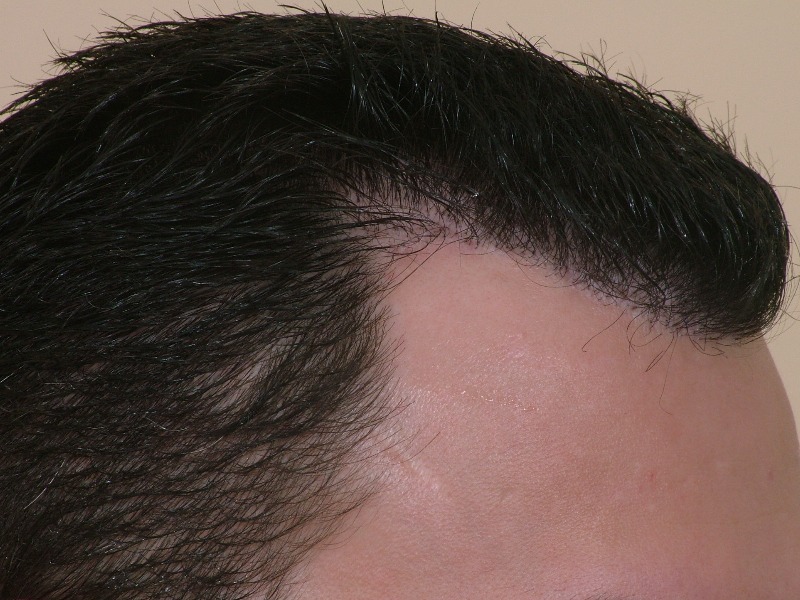 The patient had many large (11-hair) follicular units just beyond the hair line and large grafts along the entire hair line. Larger grafts placed onto the hair line create an unsightly and pluggy hair transplant that can often times be demoralizing to the patient. 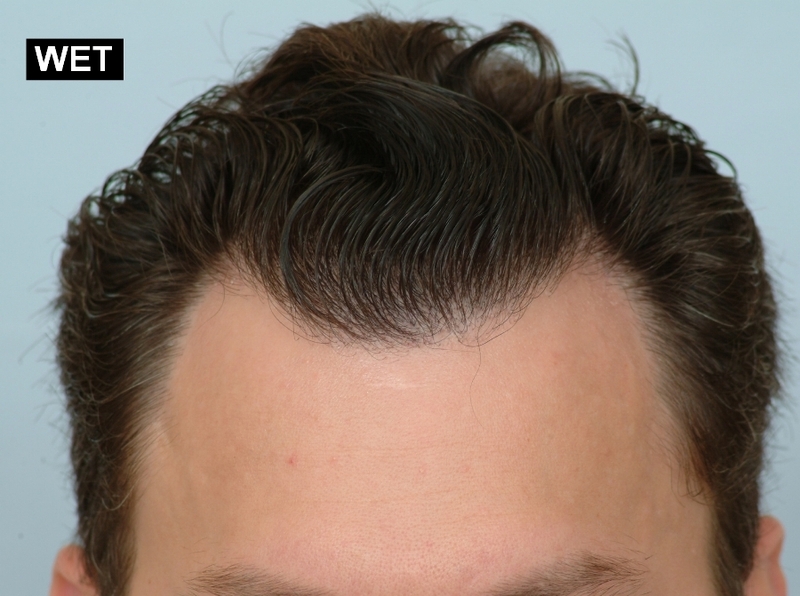 The patient has thick, coarse, slightly wavy hair and average donor density of 180 hairs per square centimeter. Dr. Cole’s treatment for this patient consisted of an arsenal of custom devices to repair this patient’s bad hair transplants from years ago. Several hundred plugs were removed, and redistributed to the frontal third to add density. The second session consisted of a couple hundred small grafts to camouflage the donor scarring as a result of the out-of-date hair transplant procedures performed from 1997 to 2002. Also in 04’ Dr. Cole redirected several follicular units to fine tune the entire frontal scalp. The last session performed by Dr. Cole consisted of the transfer of 900 CIT grafts from the donor area to achieve density. The last session was was performed to achieve maximal density to the entire frontal scalp. Honestly… that is the worst before and after comparison that I have ever seen! The difference is subtle (at best) and the pictures were taken from a satellite! The hair color has been lightened too! Show the truth or don’t bother posting the case at all! a satellite! The hair color has been lightened too! I have colored your words in purple to show how ignorantly wrong you are inregard to the actual truth. The fact that this patient has a different color of hair is obviously out of our control. 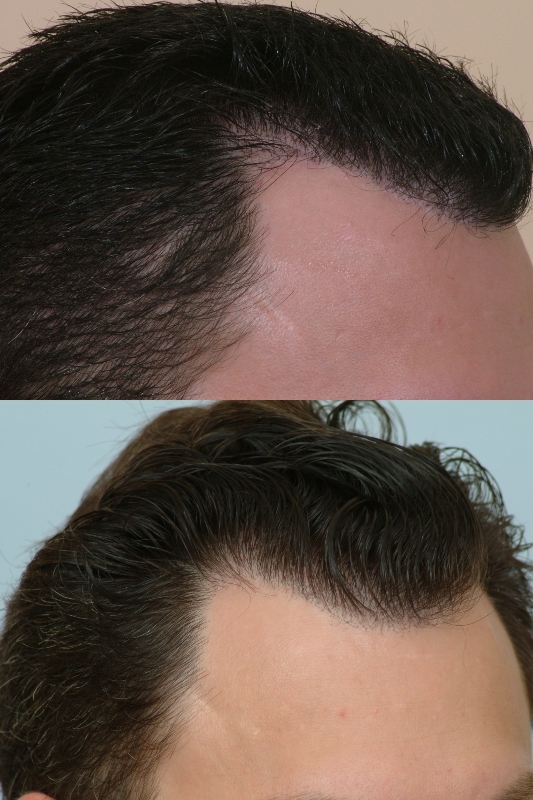 In the pre-op photos, you can clearly see “pitting” and 4 hair grafts on the fronto teporal recessions. The objective is not always to add density because too much density with large plugs on a hair line is not a natural looking result. 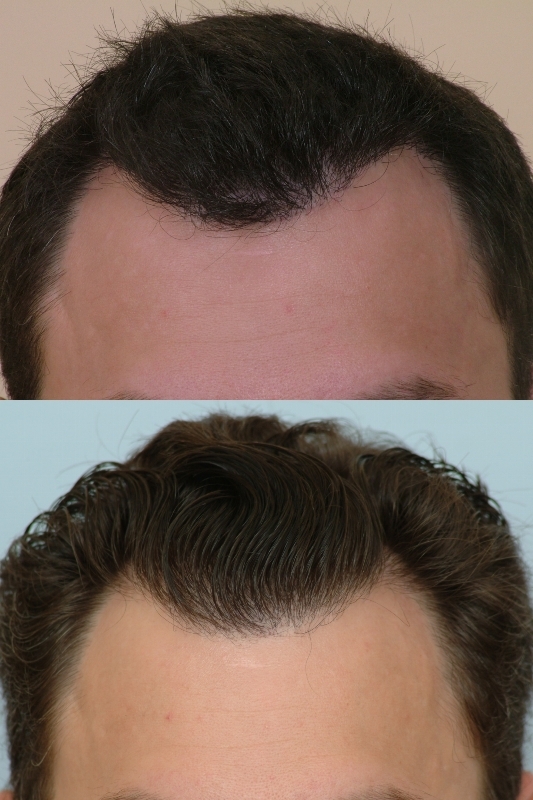 Maybe you can see the pluggyness a little better as the left and right side of this patient’s hair line is in far better condition than before. when repair work is performed, the objective is to have the outcome be subtle or drastic. In this case the patient some density to obtain a natural looking result. 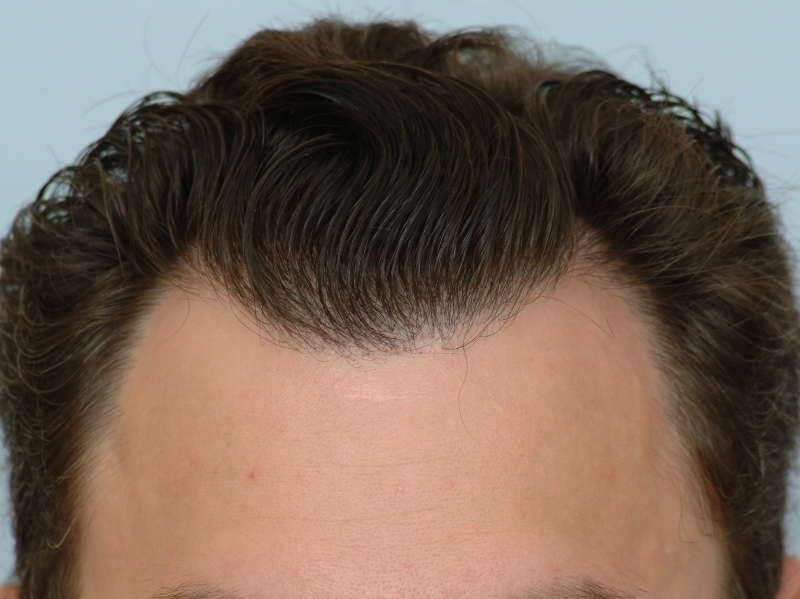 Density doesn’t matter if the hair transplant can be detected by an normal individual. It seems that you fit in the population and may or may not truely understand the nature of this repair process. If the frontal hair line has larger grafts surrounded by softer native hairs, then the results are none. 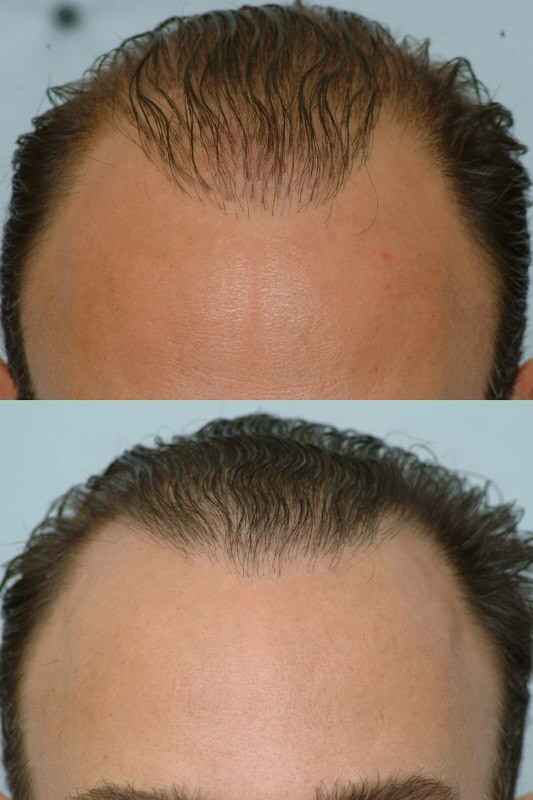 You may also notice in the “afters” that each follicular unit has decreased in thickness and size. 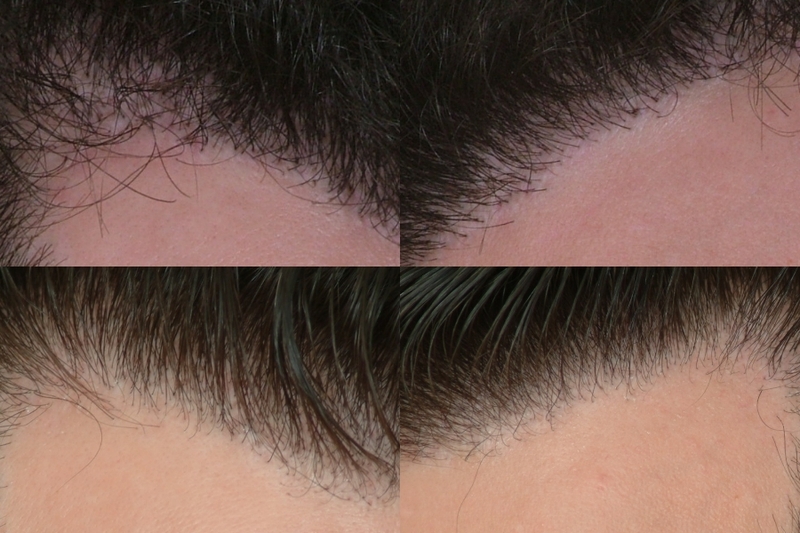 The appearence of the patient’s hair line now shows more uniformity on the hair line since the majority of smaller grafts are not surrounded by larger follicular units. You have fallen into a commmon misconception that more density equates to better results. 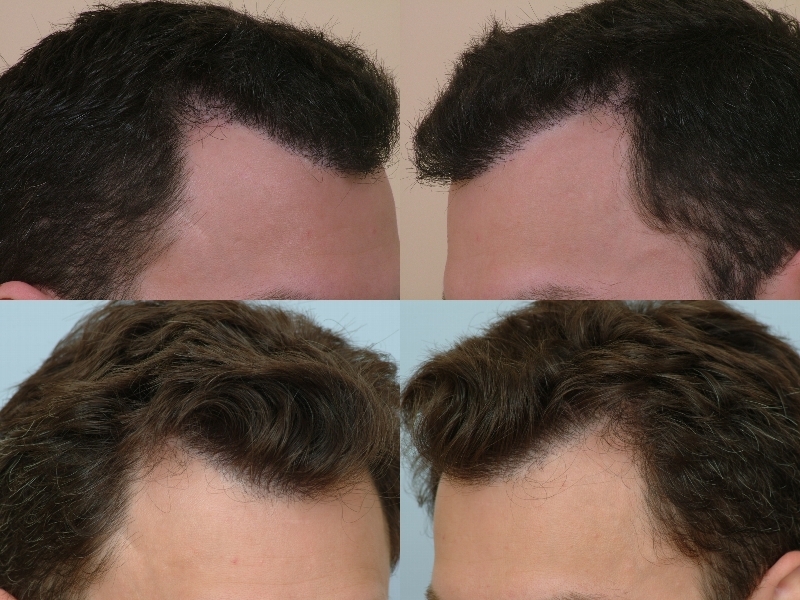 In fact, I have attached yet another comparison of the unsightly pre-op hair line versus the repaired hair line. If you are unable to see a significant difference then I may need to put my hair transplant spectacles in a safe place because all I see is one thousand words in the after photos. You can actually save the majority of the photos and open them in Microsoft photo manager to zoom in for more detail as you desire. Actually, I am giving you a response that should help educate you and the hair loss victims who take this forum seriously. I won’t say stay out of the forums because you obviously need more posters to help you understand the concept of what results are and how they are obtained. Do not take my comments personal as it is business to educate viewers such as yourself. I think some viewers understand why I chose to respond in a meaningful manner. Or you could post them at a size where we all can see what you are trying to convey! It is NOT the reader’s responsibility to blow up your photos, but rather YOUR responsibility to post them in a way that shows the results you are claiming! I had NO idea what resolution you posted them as, and had no idea that they could be blown up for greater detail. Do you disagree? You have called me ignorant and insulted my understanding of “what results are and how they are obtained”. How is that not personal? I’d like to hear other’s opinions on whether CIT is posting in a rude condescending manner, or as he claims, a “meaningful manner”. » are and how they are obtained”. How is that not personal? » condescending manner, or as he claims, a “meaningful manner”. I think CIT is passionate about the details of that clinic’s work. CIT(He or she) is usually stand-up and straight to the facts. In this forum you ask questions and don’t insult any clinics’ results by saying "Honestly… that is the worst before and after comparison that I have ever seen! The difference is subtle (at best) and the pictures were taken from a satellite! The hair color has been lightened too! I don’t think that he/she is saying that you are ignorant, I think it was used to describe your initial post in this thread, IMHO. I think you were a little harsh considering it’s a very good result. We are all adults and the people who post pictures of results, as in this case, have the added responsibility of remaining civil in the face of oft withering criticism. If you were an accountant and someone held up your spreadsheet and said TOTALLY WORTHLESS it does not exactly lend a tone of civil discourse to the proceedings. » devices to repair this patient’s bad hair transplants from years ago. » redirected several follicular units to fine tune the entire frontal scalp. » performed to achieve maximal density to the entire frontal scalp. The Pre-op photos are not that bad. You surely cant see any “plugs” that need removed from those pictures. I agree. The plug repair has made a positive impact on this case. The photo below helps provide more perspective and detail that may be better for some viewers to see the detail involved. » » a satellite! The hair color has been lightened too! » » Show the truth or don’t bother posting the case at all! » » inregard to the actual truth. » » hair grafts on the fronto teporal recessions. » » patient’s hair line is in far better condition than before. » » unsightly pre-op hair line versus the repaired hair line. » » thousand words in the after photos. » for some viewers to see the detail involved. Looks to me that he had 3 hair FUs on the hair line. Thats not natural especially with the caliber of those FUs, they are thick! » You surely cant see any “plugs” that need removed from those pictures. » » You surely cant see any “plugs” that need removed from those pictures. Average “Joe” would say that his previous HT was good mini graft work but I think the difference is that finer grafts were used to make the hair line softer. I mean, he went to have the procedure for a reason. I bet video would have shown this case even better. » » » You surely cant see any “plugs” that need removed from those pictures. » would have shown this case even better. 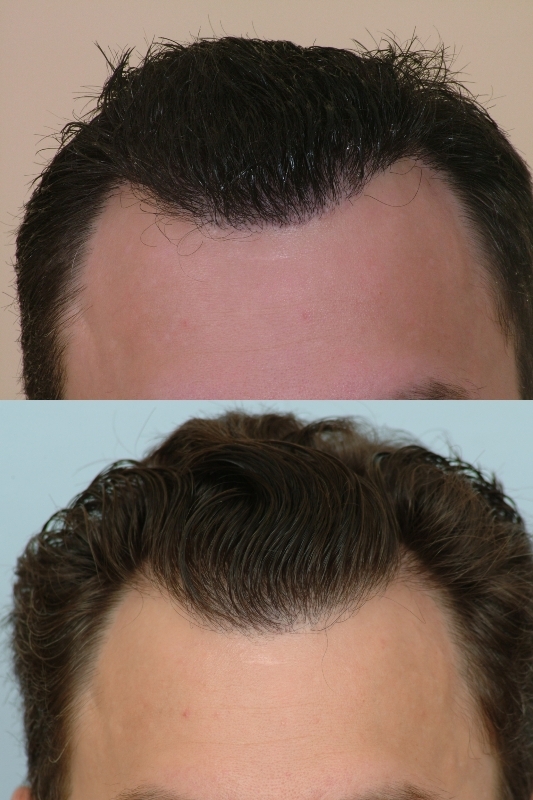 At our clinic, patients come for repair in order to have a naturally appearing hair transplant. Our definition of natural is naturally appearing hair transplants that are undetectabel by the general public. Anything less than natural is uncivilized. Repair is performed to achieve naturalness. Our definition of repair means bringing patients’ condition back to the appearance as if they never had a hair transplant. » appearing hair transplants that are undetectabel by the general public. » back to the appearance as if they never had a hair transplant. That should be the goal of every repair job. Just adding hair does not = natural. However, this patient’s photos were not representative of someone who needed “plugs” extracted. Nowhere in those photos is this evident. » » appearing hair transplants that are undetectabel by the general public. » » back to the appearance as if they never had a hair transplant. » needed “plugs” extracted. Nowhere in those photos is this evident. Are you saying that there was no repair done or that you don’t see at least a pluggy look in the pre-op pics? This is fine work. Ok, so it wasn’t just me that thought those initial photos were awful as far as showing benefit! I respect Cole’s work, but this was the worst initial photo presentation of improvement that I have ever seen from a legitimate HT doctor. CIT, you may be an awesome dude… but you blew it with the first post and the photos that you posted… just admit it already! » far as showing benefit! » of improvement that I have ever seen from a legitimate HT doctor. » the photos that you posted… just admit it already! I honestly believe that this result may be percieved as insignificant to some viewers but not so much for others with trained eyes. If you were to see this patient out in public, you would question the appearence of the hair line and maybe even take a second glance to notice the large grafts. Also, the unnatural appeareance can be misjudged if the patient has a very fine caliper of hair with mini plug grafts were place on the frontal area. IMHO, the befores depict the patient’s hair line as “bulky” & reinforced with 3-hair and 4-hair (large) grafts. A hair line should not have been created with such large grafts. I will admit that I can spot a plug from a mile away. For this reason, patients come to Dr. Cole and get what Mother Nature would have planned for them. Can you see the difference in the photo attached below? Do research if you are going to have repair performed. Many doctors go about corrective surgery in the wrong manner but that is only food for thought. » » far as showing benefit! » » of improvement that I have ever seen from a legitimate HT doctor. » » the photos that you posted… just admit it already! » hair line and maybe even take a second glance to notice the large grafts. » fine caliper of hair with mini plug grafts were place on the frontal area. » Nature would have planned for them. » surgery in the wrong manner but that is only food for thought.